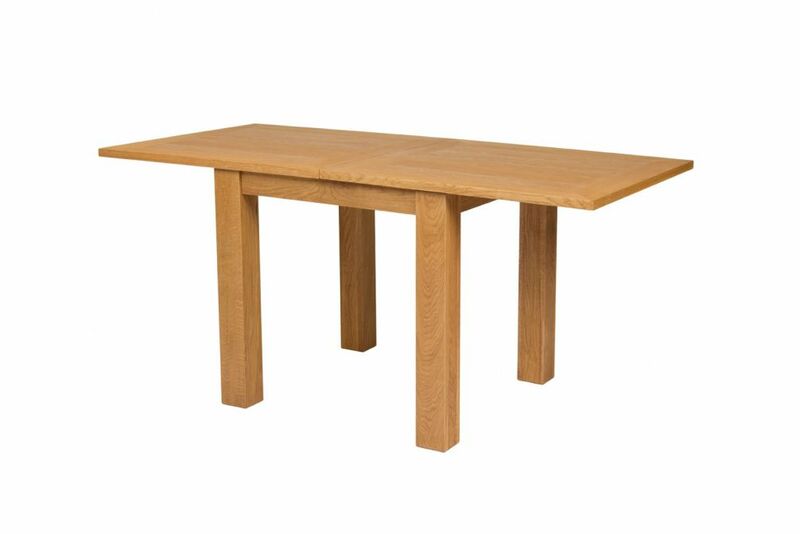 Lichfield flip top oak dining table, 80cm - 160cm. Lowest UK price guaranteed. This is a square table design that flips out to double the seating area. Please browse through the images and video to the left to see how this table works and to see some different seating combinations with chairs. You are free to mix any chair combination with any of our tables. 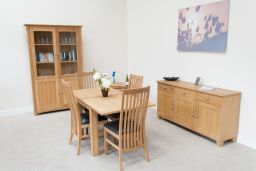 Purchase a set of matching Lichfield or Churchill chairs ( shown below ) with this table to make a great value dining set. 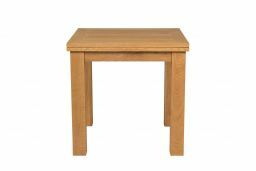 We offer a good selection of flip top tables in different shapes and sizes. 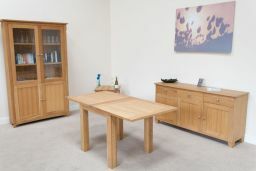 These 'flippers' are a clever alternative to the traditional extending table with a centre leaf in the middle area and are ideal for people with smaller kitchens or open plan living area where a small none conspicuous table can be quickly doubled in size when required. Dimensions: 80cm x 80cm square extending to 80cm wide x 160cm long. Not yet assembled as went straight on holiday but looks exactly what we saw in Dartford shop. Exceptional quality, exactly what I wanted & expected. Good, solid table. 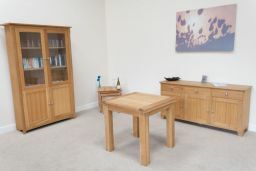 I chose Top Furniture after reading such positive reviews and they were all justified! Arranging delivery was hassle free and delivery was convenient and exactly when arranged. The instructions to put it together were clear and it was easy to do. The table itself is stunning. It's exactly as shown on the website. It feels really solid and good quality. Great value for money and the flip top extension is perfect. I couldn't be happier. 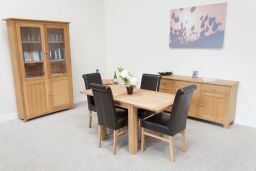 Hi just received my oak extending table fabulous quality very solid , delivery guys very pleasent and set it up for me, would highly recommend this company, good communication as well . 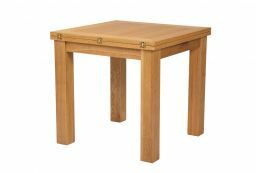 Beautiful, solidly built table. High quality finish. Nicely compact when folded and easy to slide & flip to full extent, remaining very stable. Well packaged & delivered in good time, by very pleasant & helpful delivery chaps. Wow! Fantastic table, I am so pleased with everything I have purchased from Top Furniture! We are delighted with our table! Not only that we are impressed by the service your company offers. It was delivered by a helpful young man who checked parts of it out where the cardboard had been pierced - all was well. It is beautifully made, easy to construct, although at 83( my husband ) and 79 (me) years of age we were glad of the help of a friend to help us get it upright! We shall not hesitate to recommend your company to others. Delivered on the day and at the time stated by cheerful delivery men, makes a change! Very sturdy and chunky table. Easy to put together, great size and easy to extend. Lovely oak colour. Would definitely recommend. 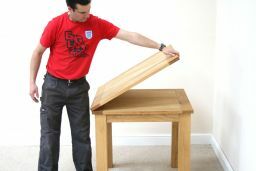 Very pleased with my new table, service and delivery exellant. Quick and easy to order and arrange delivery, driver also built table and disposed of packaging at a small charge. 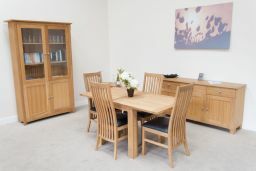 Table and chairs fit perfectly in our dining room and quality as expected. Excellent customer service. Excellent, very pleasantly surprised be the quality and sturdiness, would unreservedly recommend this. Delivery was good with a time slot that was accurate. Very happy. The perfect table for my kitchen. Very well made. Sturdy. Colour true to website depiction. Very happy with this product. Service from Top Furniture was excellent. A lady phoned to arrange a delivery day. On the agreed day, I received another call to appraise me of the time of delivery. And, on delivery, the man took it up two flights of stairs in my house, right to the area I wanted the table to be placed. I use a lot of websites and this firm is the best. No hesitation in recommending them. I would certainly use them again. Absolutely stunning build quality ,and excellent value . Dilivery superb . 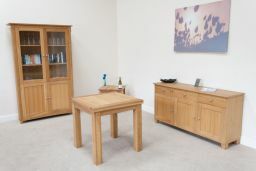 If you want superb furniture for a fair price look no further. Nothing to match it on the internet. Totally delighted with the table . I have ordered a tv unit , and in the new year a coffee table. I know I will not be disappointed . Well done top furniture . 5 star service , 5 star quality , 5 star price . I love the product it looks amazing! 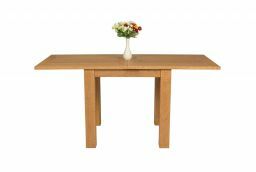 Good, weighty solid oak table, and the best value table I found too. Also the customer service was good, as this was due to be sent when we were on holiday, but was arranged to be delivered before we went away. Lovely piece of furniture. Delivered quickly. I would recommend. Fantastic high quality and stylish clever design and at half the price of some other stores. The description and pictures are very accurate. The customer service is outstanding from start to finish. With great professional and friendly communication throughout. Buy from this first class company with confidence. Highly recommended. Superb quality, better than we expected considering the price. A really solid piece. Great service, too. Fantastic service, delivery was exactly when we were told, even the time of day. 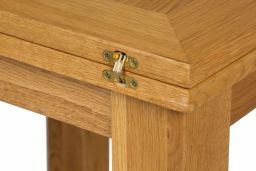 Table is a real quality well made product. Extremely well made with easy to follow instructions. All items fitted perfectly The flip top and sliders are a brilliant idea. Not the cheapest item in the marketplace but solidly made and should last for years. 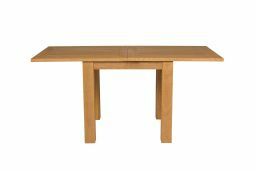 Good quality, solid table, idea for small area's, can extend to double it's length, reasonable price.